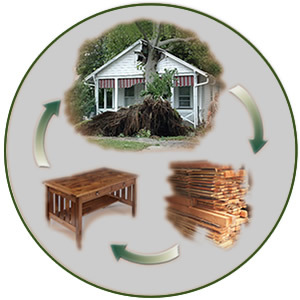 Treecovery is a network specializing in the recovery and processing of natural loss and salvage trees. We're looking for trees that have been lost due to natural causes, have become a hazard or are just plain tuckered out and have to go. We'd like to keep these trees from going to waste. We put together conscientious stewards who have trees that would go to waste, small custom mill owners and processors who can turn them into useful products and consumers who care about the source of their material. The result is a win for everyone and the environment. You can see in more detail how it works here. If you are responsible for property with trees that occasionally need removal, and wish to investigate a solution for their best use, you can read more here. If you build anything using wood, and would like to utilize sources that reflect best stewardship practices, you can read more here, access our inventory here, and place custom orders here. If you operate a small mill, and desire to enhance your business and your reputation, you can learn how here. If your business offers products or services that might play a role in this process, see how you might participate here. To enter a dialog with others participating in this process, you can join our forums here. To communicate with Treecovery, all avenues are available here.